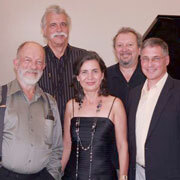 Michelleâ€™s quintet performed "JAZZ ME BLUES," which featured jazz tunes rooted in American blues. Dancing in the aisles permitted! This concert series was made possible, in part, with public funds from the New York State Council on the Arts Decentralization Program. In Putnam County, the Decentralization Program is administered by the Putnam Arts Council. Additional funding has been supplied by Feehan Agency, Southeast Shop and Trebb Audio. Pianist Tom Kohl, an arranger and composer who has performed with Quincy Jones and Clark Terry, among others. Bass player and jazz writer Bill Crow who has played with everyone, including Benny Goodman, Stan Getz, Mose Allison, Chet Baker and Ray Brown. Ed Xiques, jazz composer and master of sax, clarinet and flute, who tours regularly with Lisa Minelli and has worked with Frank Sinatra and Tony Bennett. Ron Vincent, a former member of the Gerry Mulligan Quartet, has recorded with many jazz greats including Bill Charlap, Slide Hampton and Lee Konitz. In 1996, Ron received a National Endowment for the Arts grant for jazz performance.